Once set, the ring will be effective for up to a year, however, it is recommended to replace the ring every eight weeks for optimum kill speed. Yes, simply set the trigger at varying depths on the firing bolt slot. Ensure the trap is positioned against a wall or object that the rats are traveling along. Do not set the trap in open spaces. Once set do not keep moving the trap. Change the type of bait. Banana, chocolate, peanut butter and aniseed are recommended. 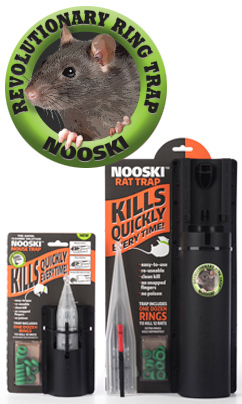 Tests have shown that several Nooski traps set in an area will produce better results than a single trap. For further information and assistance please e-mail us at [email protected] and we will do our best to help.